New servicing propositions from Halfords and Ford are hoping to secure them each a bigger take of the service, maintenance and repair market. 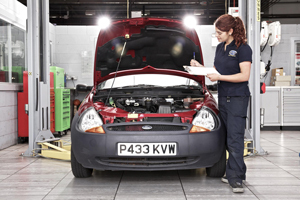 Ford has also launched new fixed-price Motorcraft servicing plans for vehicles more than three years old at its 575 locations. The scheme offers servicing prices from £119 and will also guarantee a price match on like-for-like quotes found within a five-mile radius. Fixed prices for common repairs are also on offer along with an MOT for £30 if other work is scheduled, or £35 if not. Halfords Autocentres is targeting motorists with a new entry-level offers for cars with engines of 1300cc or less. An ‘interim’ 35-point service is £79, an annual service is at £134 and a 24-month check is available for £195. Prices for larger engined cars have also decreased. Rory Carlin, Marketing Director at Halfords Autocentre, said rising fuel prices and the recession have driven demand for small engine vehicles and also mean motorists are tempted to skip services.